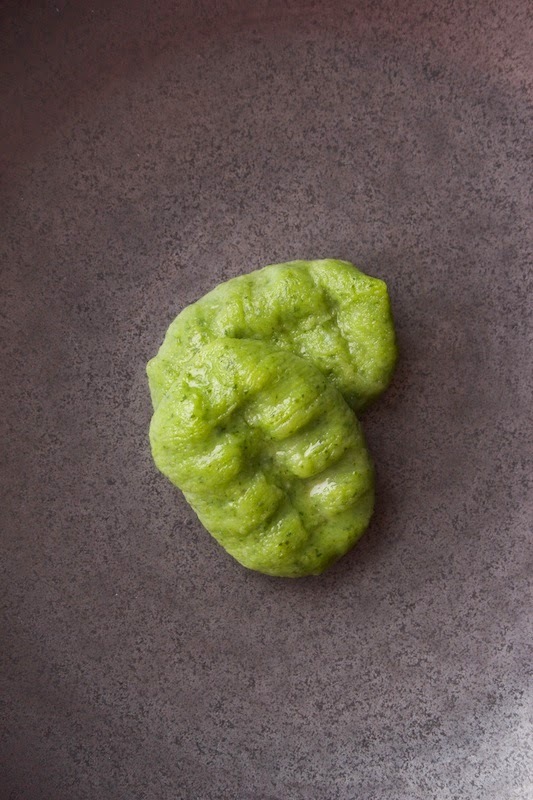 In the recently added chart for spinach you will find a recipe for spinach gnocchi. Today we will tell you more about this delicious Italian dish which is perfect for trying out endless variations. Gnocchi is a type of pasta made from potatoes. The best potatoes to use for gnocchi are old, floury potatoes. These are suitable as they contain less water and more starch than waxy potatoes, which means you don't have to add as much flour (gluten) and they produce a softer gnocchi. The classic way to prepare gnocchi is to peel the potatoes when cooked and purée them immediately to allow most of the moisture to evaporate. The potatoes are then cooled and mixed with precisely enough flour (usually less than 120 grams per 500 grams of potatoes). Just enough flour is added to absorb the moisture and provide gluten to create a cohesive dough. The dough is shaped into a long thin cylinder that is then cut into pieces. These pieces are boiled in water until they rise to the surface. Gnocchi is easy to make and suitable for freezing, allowing you to prepare large quantities at less busy times. Besides spinach gnocchi, you'll also find two other variations at Gastronomixs: green herb gnocchi and potato gnocchi with Parmesan.